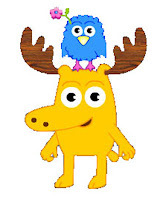 lol - Chase loves Moose A. Moose and Zee. I downloaded the patterns from the Nickolodeon website to make his own, but it's somewhere on my To Do list (maybe I'll get to it when that my frenzied "nesting" phase kicks in). We're huge Nick Jr. fans as well - I feel like I've betrayed my childhood fav (Sesame Street), but it's a new day!!!! I'm so glad to hear how William is flourishing so much with his vocabulary, letters, and numbers! That is awesome! I knew it was just a matter of time... I think many "youngest children" take their time with these things, because they have older siblings to talk/do things for them. Go William!! !